It is so good to be painting outside in comfort again. Not that it was a very tough winter. I absolutely love and prefer to be painting outside but it is not without its challenges. For me the comfort level isn't an issue. The real challenge is dealing with the ever changing humidity. 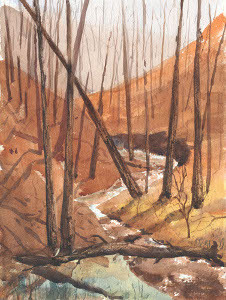 While painting "Spring Creek" the warm spring sun and good breeze were drying my paper much faster than I would have liked. I was very unhappy with this when I got home but after a half hour in my studio making a few compositional changes I am okay with it. I certainly enjoyed the process even if it was challenging. Obviously I haven't been painting much however getting out painting in the good weather the last couple of Tuesdays, joining the Ontario Plein Air Society and a brief chat with Ian Thomas after his concert Saturday night have me motivated again. I have been struggling the last few times out but I am posting the last painting that I feel is at least reasonable. 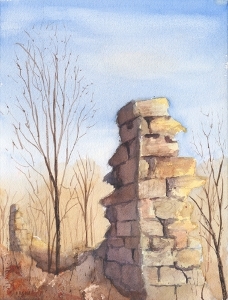 This watercolour is 11" X 15" and was painted "en plein air" I did some research and originally titled this "Cold Springs Grist Mill" however after a chat with the property owner I learned that it was actually a woolen mill. Oops.